Back with another tag! This one has been floating around the blogosphere for a while, and I’ve always wanted to do it. So huge thanks to Anatomy of a Book Thief for tagging me! Not only is her blog amazing, but she is super sweet AND recognizes that The Book Thief is THE BEST book ever to be written or read. An automatic plus in my book*. 1. FIND A BOOK ON YOUR SHELVES OR E-READER WITH A BLUE COVER. WHAT MADE YOU WANT TO PICK UP THIS BOOK? 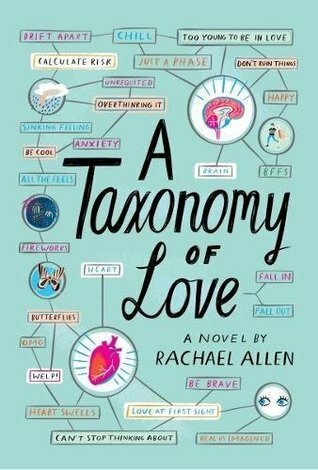 If we’re being completely honest, I picked up A Taxonomy of Love by Rachael Allen because the cover was pretty and clever and I saw it on NetGalley. It was during one of my NetGalley binges, okay!? But we all know how much I love stories told through a long period of time so you can see how relationships grow and change, which this book not only promised, but delivered. 2. THINK OF A BOOK YOU DIDN’T EXPECT TO ENJOY, BUT DID. WHY DID YOU READ IT IN THE FIRST PLACE? I didn’t expect to love this one because it’s mystery, which isn’t my genre. But when I was treating myself to some birthday books, I decided to mix up the genres, in case I went into a slump not like I did or anything haha jokes. 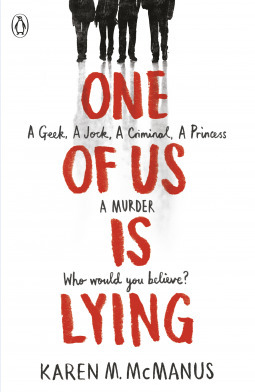 And I chose to add One of Us is Lying to my cart because I had heard such good things about it on the blogosphere. Also the whole multiple POV sounded prettyy interesting. 3. STAND IN FRONT OF YOUR BOOKSHELF WITH YOUR EYES CLOSED AND PICK A BOOK AT RANDOM. HOW DID YOU DISCOVER THIS BOOK? (To add to the fun I even closed my eyes and spun in a circle three times). I remember that the first time I heard about this book was at camp six years ago. When you’re gone for seven weeks, you go through all your books you packed, so your bunk becomes like a library. 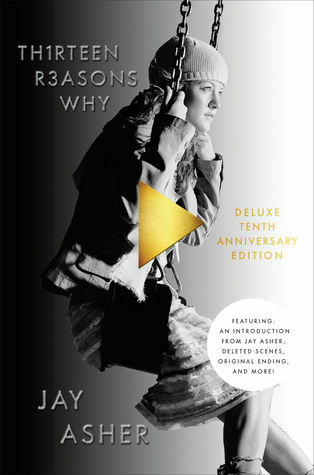 Someone had brought Thirteen Reasons Why and it was the book to read. You had to practically be on a waiting list to get it. I remember hearing that it was sad and decided that I wasn’t going to read any sad books at camp, so I didn’t try for it. Fast forward to a year ago. By that point I basically decided I wasn’t going to read it. Not because it didn’t sound interesting or anything, but it just wasn’t on my radar anymore. There were other books I wanted more. I was at an independent bookstore in DC that I dragged my friends to and was taking my usual hour to pick out two books to buy. 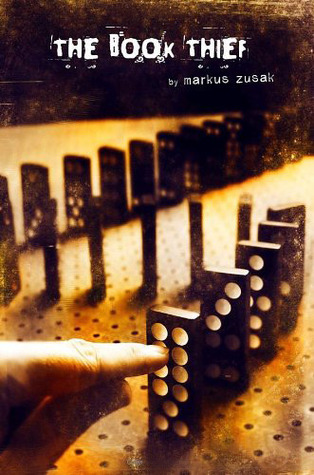 My friend placed Thirteen Reasons Why in my hand and was like this is a must read book. You cannot go any longer without reading it. And since she was also a reader and my friend I trusted her opinion and bought it. 4. PICK A BOOK THAT SOMEONE PERSONALLY RECCOMMENDED TO YOU. WHAT DID YOU THINK OF IT? Same trip to the independent bookstore. I know what you’re thinking, this was the second book I bought that day. Well, you’d be wrong! I was contemplating it and the same friend was like I have it I’ll give it to you because you also need to read this one. * And, well, safe to say I LOVED it, as evident by my review**. 5. 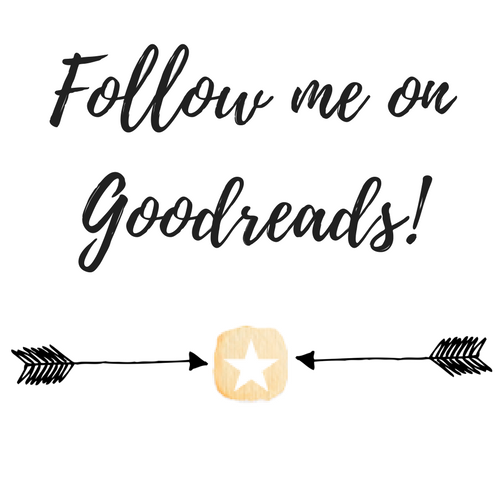 PICK A BOOK THAT YOU DISCOVERED THROUGH BOOKTUBE/BOOK BLOGS. LITERALLY EVERY BOOK I’VE READ THIS PAST YEAR. But let’s go with one that I truly would not have picked up on my own, shall we? I usually don’t love reading Cinderella retellings, because they’re so overdone. They’re like the Romeo and Juliet trope of retellings. Did that make sense to anyone but me? 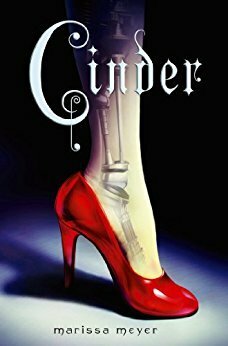 Cinderella retellings are basically the go to, and even find their way into contemporaries that are very loosely based off of it. So suffice to say I was wary of another Cinderella retelling. But after all of Mandy’s fangirling, I decided I just had to read it, and am definitely not regretting the choice! 6. FIND A BOOK ON YOUR BOOKSHELVES OR E-READER WTH A ONE WORD TITLE. WHAT DREW YOU TO THIS BOOK? Jessi Kirby is an author not talked about nearly as much as she should be, so I am going to promote her right now! This is one of the three I’ve read by her, and although it is not my favorite, it’s the most unique, I think. Seventeen-year-old Parker Frost has never taken the road less traveled. Valedictorian and quintessential good girl, she’s about to graduate high school without ever having kissed her crush or broken the rules. So when fate drops a clue in her lap—one that might be the key to unraveling a town mystery—she decides to take a chance. Julianna Farnetti and Shane Cruz are remembered as the golden couple of Summit Lakes High—perfect in every way, meant to be together forever. But Julianna’s journal tells a different story—one of doubts about Shane and a forbidden romance with an older, artistic guy. These are the secrets that were swept away with her the night that Shane’s jeep plunged into an icy river, leaving behind a grieving town and no bodies to bury. Safe to say, one reason I was drawn to this book was because I related to Parker. But the real reason I picked it up was the whole thing about tying two stories together. And what does the journal say??? It’s a mystery and a contemporary and a coming of age story all in one. Yes there’s a slight romance between Parker and Trevor, but it’s super easy to ignore because the main story is about Julianna, Shane, and the artist, and Parker and herself. 7. WHAT BOOK DID YOU DISCOVER THROUGH A FILM/TV ADAPTION? *If I’m being completely honest, the hype still scares me so I am yet to read it. But I’m getting closer! 8. THINK OF YOUR ALL TIME FAVOURITE BOOK(S). WHEN DID YOU READ THEM AND WHY DID YOU PICK THEM UP IN THE FIRST PLACE? Stealing your answer here because this book is truly my favorite. Disregard all those other times I say a book is my favorite, I mean it this time. So funny story, the first time I saw this book I thought it was some sort of mystery. Like who stole the book???? I think it’s because the font looks slightly like that ransom note font, and it has the word thief in it. But I’m not totally sure when I first read it, or why. One day I just decided I was going to, and I did, and I’ve loved it ever since. My rereading of it about a year ago is what elevated it to favorite status, as I realized nothing will ever come close to my love for it. So that’s how I choose my books! A lot seems to be based off of your opinions, and the covers, along with a bunch of tropes I just die for. Have you read any of these books? How do you normally choose your books? loved my review? let others know! No problem 😊 I can’t wait to see your answers! 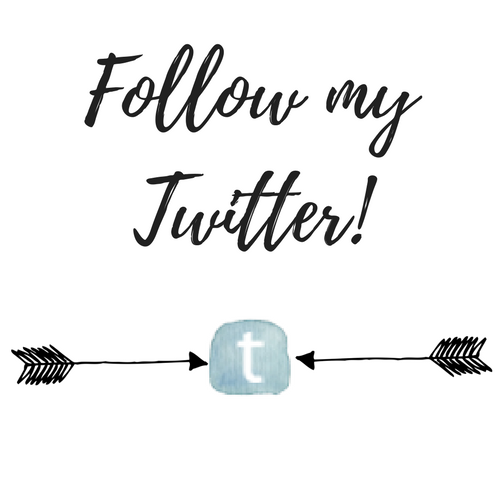 Thanks for the book tag!! I will schedule this one in for next Sunday! oh I’m looking forward to it! To be honest I usually just pick something I’m vaguely familiar with, whether because I know the author or read some reviews, but sometimes I pick books on a whim and am pleasantly surprised. And heartbroken. That’s what happened with The Fault in our Stars by John Green and Paper Valentine by Brenna Yovanoff. Yeah I used to use amazon recommendations but as soon as I got a book blog all the books I’ve gotten have been recommended or I’ve seen good reviews of it. A Taxonomy Of Love sounds so interesting! 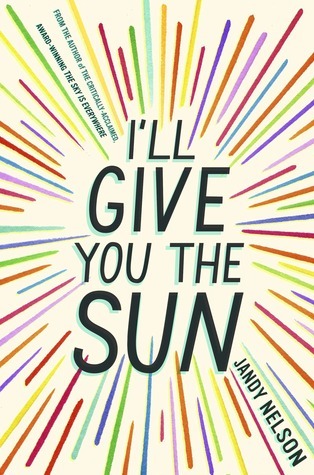 I loved I’ll Give You The Sun, Cinder and Thirteen Reasons Why. Also, I want more books like One Of Us Is Lying. I don’t read crime thrillers unless they’re by specific authors I trust- I just don’t enjoy reading them much. 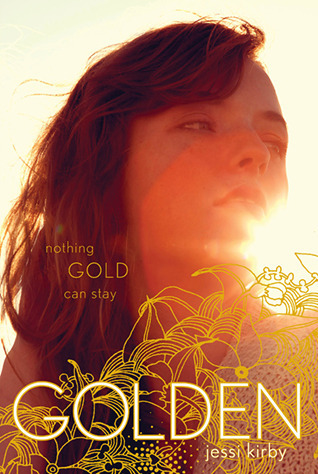 So, the fact that this book was a YA crime thriller with Breakfast Club vibes and a faint but intriguing romance did it for me. But, Sydney, sorry for hyping up the book even more for you (because I KNOW all about avoiding too popular books because MAN EVERYONE LOVES THEM) but you HAVE to read Simon. It’s literally the cutest book ever. But, like, no pressure. Really. A Taxonomy of Love was really really cute! I got the ARC version so the only thing I would say was the format was a bit messed up but it was still adorable and I loved it. I want more books like One of Us is Lying too. It was a YA thriller so like kinda tame. I really just liked the whole Breakfast Club feel to it though. 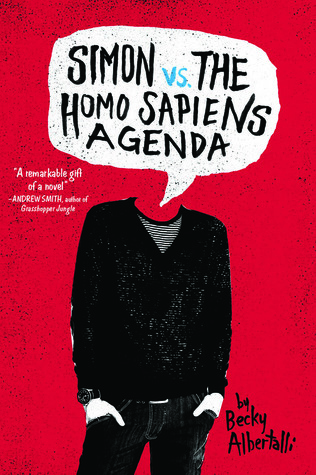 Also, if you read Simon now, you can take part in everyone losing their minds and freaking out about Love, Simon- maybe that’ll give you the incentive to start reading it! Okay I just read this because I’ve been busy with school lately and I hadn’t realized you had tagged me! Thank you so much!!! By the way, I just added A Taxonomy of Love to my tbr so thank you for that as well! oh yay! And haha no biggie I totally understand being busy. Can’t wait to see your answers!